At the first sign of symptoms, seek an appointment with your doctor or a specialist women’s health physiotherapist. See iscp.ie for a full listing of chartered physiotherapists. Leaving things leak for years and relying on pads reduces the chances of successful treatment. If going private, you can walk in the door; if going public, you need to be referred by a doctor. If you are entitled to post-natal physio classes, put attending them at the top of your to-do list. Sort a babysitter out, no matter what. Use pads as a stop gap. Ideally all women should be continent and shouldn’t have to spend their money on pads. There are endless varieties available including a new natural and biodegradable pad by Natracare. For keeping fit, use supportive gear such as EVB sportswear designed by Irish woman Yvonne Brady. “They elevate the perineum against the urethra and are especially useful for younger women who want to exercise,” says consultant urogynaecologist Dr Suzanne O’Sullivan. Cut down on diuretics such as tea, coffee and coke. 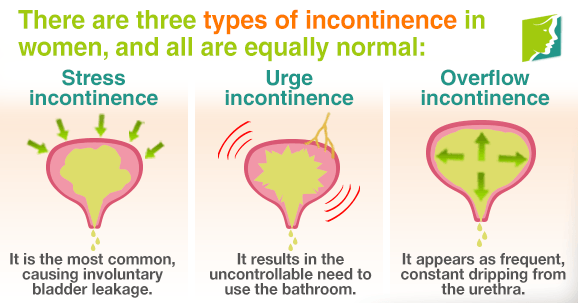 Consult the Continence Foundation of Ireland (continence.ie), the overactive bladder information site (oab.ie) and advice on waking at night (waketopee.ie).